Thanksgiving is rapidly approaching, everyone! What are you thankful for? 1. My friends and family, of course. 2. My health. Your health. Everyone who is healthy’s health. 3. My new puppy (even when she is bad). 4. My job, because I am lucky enough to love what I do. 5. All of the things I did not lose due to Hurricane Sandy, including my life, my house, my belongings, and electricity. 6. The fact that I will be in a food coma on my couch on Thanksgiving at 8pm, not at Walmart/Kmart/Sears/Toys “R” Us. Oh, and also for the fact that I will, as a result, have a much lower risk of being trampled, pepper sprayed, shot, or otherwise injured by a crazed public mass this week. 7. Beer. In fact, liquor in general. Let’s also add liquor stores. 8. That the 2012 Presidential Election is over. 9. That Thanksgiving is celebrated with delicious food. 10. That there are a million things you can make out of leftover aforementioned Thanksgiving food. Of course, there are many other things I’m thankful for, but I’ll stop there to elaborate on #10. Now, don’t get me wrong, I could probably eat all of the leftovers from Thanksgiving every day for a week straight without changing a single thing about them. However, sometimes my friends and I have our own little Thanksgiving either before or after the actual holiday, and if you’re celebrating Thanksgiving twice, you might want to switch up one of them a bit. And so, what is one to make when they have plenty of leftovers from Thanksgiving Part I and they plan on having people over for Thanksgiving Part II? Quesadillas. Why? Because on the list of things I am grateful for, quesadillas would have been #11. 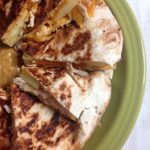 You can put pretty much anything in a quesadilla, and it winds up being delicious. Maybe it’s because they are always stuffed with cheese of some sort, and you really just can’t go wrong there. Some sort of cheese tastes good with everything, and there are so many options. When I decided I’d make Thanksgiving quesadillas, I couldn’t decide between cheddar or brie cheese, so I did what had to be done and I made both types of quesadillas. I know, I know, how scandalous! I’m not going to give you exact amounts, because making food out of leftovers is all about what you have on hand. Get creative and use your best judgment. Thanksgiving leftovers get an update. Drain your can of mandarin orange slices and pat the slices dry with a towel. Make sure you dry both sides well. Take your can of jellied cranberry sauce and your mandarin orange slices and throw them both in a blender. Mix until the oranges have all been chopped up. Spread the cranberry-orange mixture onto two tortillas until the tortillas are covered. Add your brie cheese to each tortilla, and top one with turkey. Then sandwich the two tortillas together. Spray a medium-sized skillet with cooking spray and cook your quesadilla over medium heat until it browns and the cheese melts, flipping once. 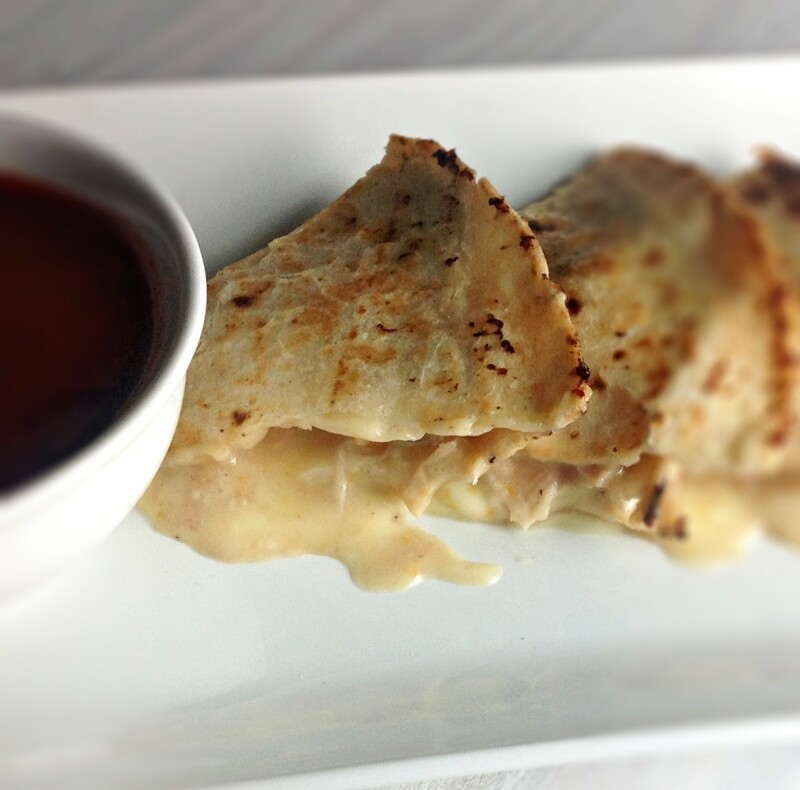 Cut into 6ths and serve the gooey quesadillas with the leftover Cranberry-Orange Sauce for dipping. Thinly slice the honeycrisp apple and set aside. Spread honey mustard on two tortillas until the tortillas are covered. 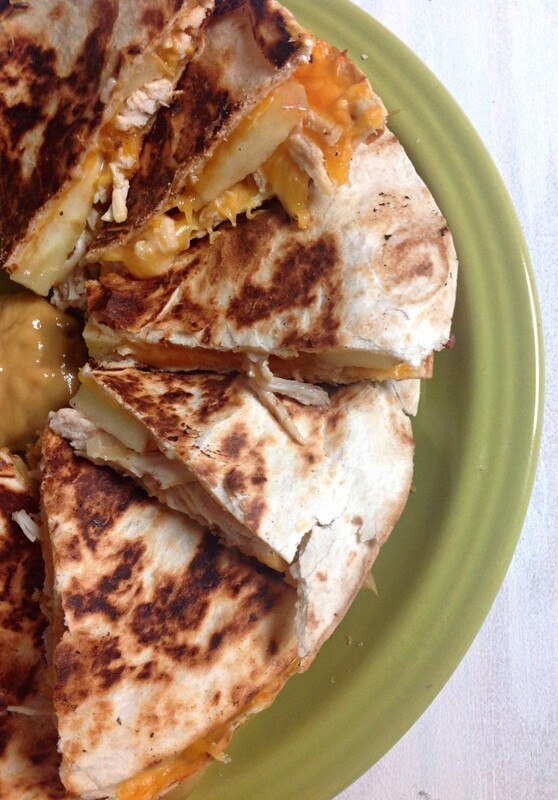 Top one tortilla with cheddar cheese, then turkey, then apple slices, then more cheddar cheese to bind the quesadilla. Sandwich the two tortillas together. Cut into 6ths and serve with extra honey mustard for dipping. These recipes look delicious and easy. This looks awesome for my leftovers. 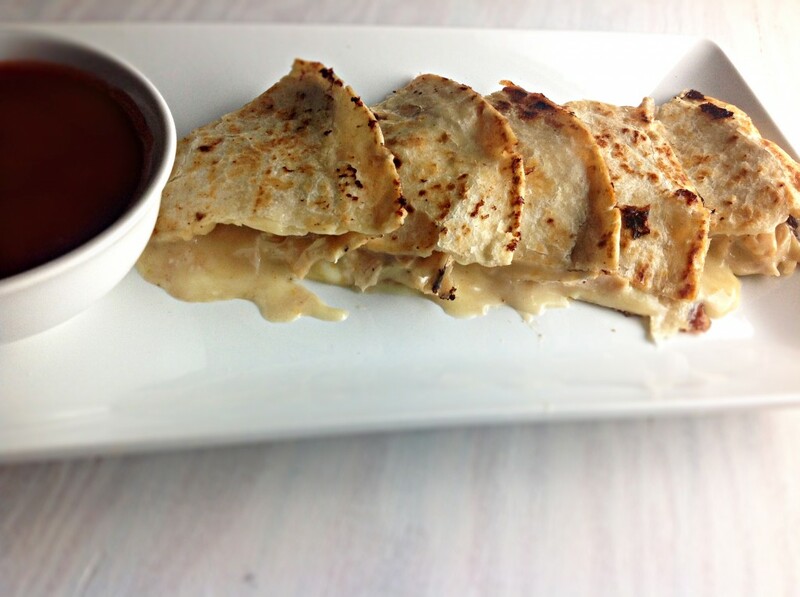 I think I’ll probably use my actual cranberry sauce for them, but never thought to put brie in a quesadilla! What a wonderful invention! Thanks! This was early on in the blogging days so I wasn’t that skilled with pictures yet, but you can definitely make some pretty looking, fantastic tasting quesadillas with brie and cranberry sauce! Let me know what you think after you give it a try!